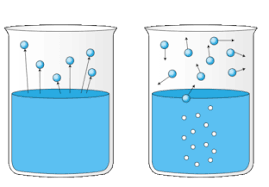 Distinguish, differentiate, compare and explain what is the main difference between Boiling and Evaporation for Class 9 in points in tabular form. Comparison and Differences. Evaporation process occurs when we heat the liquid. For example, as the sun heats water in a puddle, the puddle slowly shrinks. The water seems to disappear, but it actually moves into the air as a gas called water vapor. This is an example of evaporation. All molecules in a liquid move. Some move faster than others, though. As the molecules at the surface of a liquid absorb heat, they begin to move around more quickly. This gives them the energy to break the bonds that connect them to other water molecules. When the molecules are moving fast enough, they are able to “escape.” They leave the surface of the liquid as gas molecules. Define what is Boiling and Boiling point? Evaporation is not the only process that can change a substance from a liquid to a gas. The same change can occur through boiling. As a liquid heats up, its molecules absorb heat and move faster. When the liquid starts to boil, bubbles of vapor form within the liquid and rise to the surface. The temperature that causes this to happen is known as the boiling point of a liquid. 2. Boiling process is quick as compared to evaporation. 3. In the boiling, bubbles are formed whereas in evaporation no bubbles formed. 4. Boiling occurs throughout the liquid. Evaporation takes place only from the exposed surface of the liquid. 5. Boiling occurs at a definite temperature known as a boiling point. Evaporation happens below a boiling point of the liquid. 6. In boiling, the source of energy is needed. In evaporation, energy is supplied by surroundings.